Harrison Burton kicks off his first full-time NASCAR Gander Outdoors Truck Series (NGOTS) campaign driving the No. 18 Safelite AutoGlass Tundra in Friday night’s NextEra Energy 250 at Daytona (Fla.) International Speedway. Burton, who will be a Sunoco Rookie of the Year contender in 2019, made his Truck Series debut Oct. 29, 2016 at Martinsville (Va.) Speedway just 20 days after his 16th birthday. While driving a limited Truck Series schedule the last three seasons, the talented teenager has produced one pole, 76 laps led, four top-five and six top-10 finishes resulting in an average finish of 10.2. The North Carolina native captured the pole, led 30 laps and earned a career-best third-place finish at Iowa Speedway last June and also finished third last November at ISM Raceway in Avondale, Ariz.
Burton led a race-high 48 laps en route to the victory while making the first superspeedway start of his career in last week’s ARCA Racing Series season opener at Daytona. The second-generation driver became the third member of the Burton family to take his team to victory lane at the World Center of Racing. His father, Jeff Burton, won the July race in NASCAR’s premier series at the 2.5-mile tri-oval and his uncle, Ward Burton, won the Daytona 500 in February of 2002. The victory was Burton’s third career ARCA Racing Series victory across just 12 starts. Mike Hillman Jr. and the No. 51 team that worked with Burton for his eight-race schedule last season will move over to guide the 18-year-old’s rookie campaign in the No. 18 Tundra this year. Hillman Jr. is a two-time champion crew chief in the Truck Series. He guided Todd Bodine to Toyota’s first-ever National Series title in 2006 and the duo won the championship again in 2010. Burton has produced one pole, four top-five and seven top-10 finishes resulting in an average finish of 6.3 in nine starts with Hillman Jr. calling the shots since the veteran crew chief joined KBM in October of 2017. The New York native was atop the pit box for Burton in last week’s ARCA Series race for Venturini Motorsports and captured back-to-back Truck Series victories at Daytona with Bodine (2008 and 2009). Burton captured the 2017 NASCAR K&N Pro Series East title after registering a series-high five wins, two poles, 142 laps led, 12 top-five and 14 top-10 finishes and an average finish of 3.3 across the series’ 14 events. In addition to his five K&N victories, and three ARCA Racing Series wins, he has numerous Super Late Model victories including the 2018 Rattler 250 at South Alabama Speedway in Kinston, Ala., and the 2017 ARCA/CRA SpeedFest at Crisp Motorsports Park in Cordele, Ga.
How have your limited schedules the last three seasons helped you prepare for your first full-time campaign? 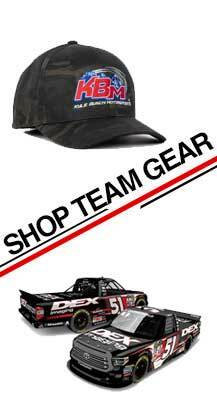 How will your win in the ARCA Series last week help you in the Truck Series this week? Have you set any goals for this season? Across 15 career NCWTS starts has collected one pole, 76 laps led, four top-five and six top-10 finishes resulting in an average finish of 10.2. Has three career ARCA Racing Series victories across 12 starts, including the 2019 season opener at Daytona International Speedway. KBM-26: The Safelite AutoGlass team will unload KBM-26 for Friday night’s NextEra Energy 250 at Daytona. David Gilliland sat on the pole and finished third with the same Tundra in its most recent outing at Talladega (Ala.) Superspeedway last October. Spencer Davis earned a seventh-place finish with it in last year’s season-opening race at Daytona. KBM drivers have collected one win, one pole, 79 laps led, four top-five and eight top-10 finishes resulting in an average finish of 16.6 across 22 starts at Daytona. Owner-driver Kyle Busch picked up the team’s lone victory at the 2.5-mile tri-oval in dramatic fashion in the 2014 season opener, finishing .016 seconds ahead of fellow Toyota competitor Timothy Peters. KBM holds the NGOTS records for most career wins (68) and most wins in a single season (14 in 2014). In addition to collecting a series-record six Owner’s Championships, the organization has produced two championship-winning drivers; Erik Jones (2015) and Christopher Bell (2017).